The biblical background of the holiday is Leviticus 23:15, which mandates the counting of seven weeks between Passover and Shavuot (Weeks). Lag B'Omer just means the 33rd day of this count (the 18th of Iyar). The festival commemorates, among other things, the traditional date of the death of Rabbi Shimon bar Yochai (Yohai). Last year's Lag B'Omer post is here with links, and see also here and here. More recent posts are here, here, here, and here, with links. PROF. LAWRENCE H. SCHIFFMAN: REMEMBERING LOUIS H. FELDMAN: RENOWNED EXPERT ON FLAVIUS JOSEPHUS. This obituary by Professor Schiffman in Ami Magazine remembers the late Professor Feldman and recounts the latter's many scholarly contributions, especially to the study of Josephus. ALIN SUCIU: Guest Post: Lance Jenott – The Investiture of the Archangel Gabriel. An English translation of this little-known text written in the little-known genre of (apocryphal) "apostolic memoirs." Cross-file under New Testament Apocrypha Watch and Coptic Watch. HERITAGE DAILY: Guide to the classics: the Epic of Gilgamesh. (Louise Pryke). This is a nice summary of the story of Gilgamesh in the Epic, other related stories about Gilgamesh, and a brief account of the importance of the Gilgamesh traditions, the history of the rediscovery of Gilgamesh, and the current state of our knowledge of the text of the Epic. One detail: my understanding of the Epic (and I did read much of it in Akkadian with William Moran, many years ago) is that Gilgamesh received the secret of extended life, not eternal life. Utnapishtim (or whatever they think the correct form of the name is now) gave him a plant that would make him young again, but there is no indication that the youth would be permanent. In any case, Gilgamesh carelessly lost the plant, so we will never know. Regular readers will be aware that Gilgamesh is a character in ancient Jewish literature. He appears as one of the giants in the Book of Giants. I have collected many past posts on Gilgamesh here. There you can read about him in the Book of Giants, and even in a later Syriac text, and also about most of the other issues mentioned above. And I have some additional posts involving Gilgamesh here, here, here, and here. ASKING THE IMPORTANT QUESTIONS: Is the Apocrypha Kosher? What Is the Jewish View? (Yehuda Shurpin, Chabad.org). Chabad.org is a religious site and this essay is written from a particular religious perspective, which is fine. I am always interested when noncanonical scriptures receive some attention. This essay discusses Ben Sira, 1 Enoch, 1-2 Maccabees, etc. And it mentions several other works. Cross-file under Old Testament Apocrypha Watch and Old Testament Pseudepigrapha Watch. ON THIS DAY IN 1960, Yigael Yadin made his famous announcement of the discovery of a cache of documents from the time of the Bar Kokhba Revolt. The anniversary was noted by Haaretz in 2015, but I cant find any notice of it in the media this year. The announcement was one of the most dramatic moments in the history of Israeli archaeology. You can read about it here. This year's anniversary almost counts as a cosmic synchronicity, because it comes the day before Lag B'Omer. This holiday has become, among other things, an annual commemoration of the Bar Kokhba Revolt. A couple of years ago I collected past PaleoJudaica posts on the Bar Kokhba Revolt, including ones on its connections with Lag B'Omer. I also linked to posts on the site of Betar (Battir), the central site of the revolt, on which more here and in yesterday's post. Yesterday's post also collected recent posts on Philip Esler's new book on the Babatha archive. Since the roundup two years ago, there have been posts on the archaeology of the revolt (more or less) here, here, here, here, here, and here. Posts on last year's archaeological expedition to re-explore the the Cave of Skulls are here, here, here, and links. Recent posts on coins of the Bar Kokhba Revolt are here and here. Other posts on the Bar Kokhba Revolt from the last couple of years are here, here, here, here, and here. THE ANXIOUS BENCH: Alternative Scriptures: The First Discovery of Qumran. Philip Jenkins reviews the discovery of the Cairo Geniza in the late 19th century. Solomon Schechter found portions of the Damascus Document in the Geniza. 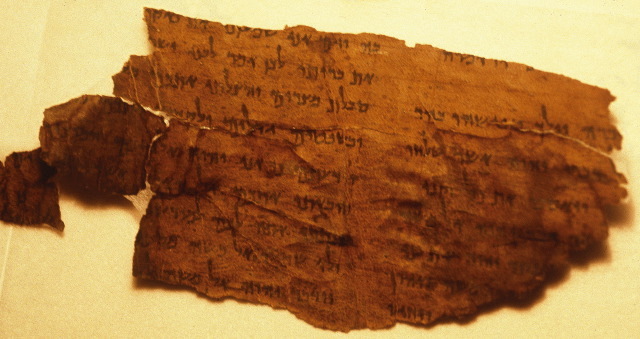 Fragments of the Damascus Document were found much later among the Dead Sea Scrolls and it turned out that it was a Qumran sectarian document. Schechter drew many correct inferences from his medieval copy of the Damascus Document about the Qumran sectarians, although he got some things wrong too. The first post in Professor Jenkins's Alternative Scriptures series was noted here. Schechter's centennial yahrzeit (death anniversary) was in 2015. See here and here. For past PaleoJudaica posts on the Cairo Geniza, see here and many links. ALIN SUCIU: Ariel Sabar in Göttingen. Mr. Sabar will be at Georg-August-Universität on 23 May to discuss the Gospel of Jesus' Wife forgery. Background on the story of the GJW is here with oh so many links. LYRICS, DUDE! Into the Fire: A Jewish studies prof. searches for The Bible in the lyrics of The Boss. Azzan Yadin-Israel maps theological parallels in the songs of Bruce Springsteen, finding Sodom and Gomorrah, the Exodus, and much more from Testaments Old and Ne (CATHRYN J. PRINCE, Times of Israel). A postmodern project from a specialist in ancient Judaism. I'm not convinced that all of the scriptural allusions proposed in this article are really in Springsteen's lyrics, but a lot of them are. UPDATE: Israel charges Palestinian man with murdering British student on Jerusalem tram (Raf Sanchez, The Telegraph). Ms. Bladon was a biblical studies student at the University of Birmingham. She was on an exchange semester at the Rothberg International School in Jerusalem. The man charged with killing her, Jamil Tamimi, had a long history of mental illness and had just been released from a psychiatric hospital the day before. He has been found competent to stand trial. Was the Qumran community celibate? BIBLE HISTORY DAILY: First Person: Was the Dead Sea Scroll Community Celibate? Biblical Archaeology Review editor Hershel Shanks comments on an article on the Qumran community by Devorah Dimant in the current issue of BAR. Yes, this is a good question, the answer to which is not at all clear to me. And yes, research on the Qumran sectarians is "unsettled." I think we know less about them now than scholars thought they did a generation or two ago. Paradoxically, I also think that is progress. I have collected some past posts on the subject of the Qumran sectarians here. TIMES OF ISRAEL BLOG: Bar Kokhba: When (rabbinic) leadership fails (Aaron Koller). This essay gives a good summary of what we know about the Bar Kokhba Revolt. It also offers some plausible speculation about why the Tanaaitic literature (the Rabbinic literature up to the third century) says virtually nothing about it. Incidentally, I have found one, and only one, reference to the Bar Kokhba Revolt in the Tannaitic literature. In Mishnah Tannaith 4.6 there is a brief list of bad things that happened on the 9th of the month Av in the Jewish calendar. These were very bad things, including the destruction of the Temples by the Babylonians and the Romans. One of the items in the list is "and Betar was captured." The city Betar, we learn from later Rabbinic traditions, was the center of the Bar Kokhba Revolt. Bar Kokhba himself supposedly died there when it fell to the Romans. The Mishnah assumes that the reader knows the full story and this is all it has to say. There are many past PaleoJudaica posts on the Bar Kokhba Revolt. I will have more to say about that tomorrow. Recent posts on the Babatha archive are here, here, and here. UPDATE (12 May): the post promised above is now here. ITINERARY: TRUMP’S ISRAEL VISIT SAID TO INCLUDE STOPS AT MASADA, WESTERN WALL. A partial schedule for US President Donald Trump's much-expected visit to Israel has been released; Masada, the Western Wall and Yad Vashem are some of the highlights in his two-day stop (JTA via the Jerusalem Post). There have been conflicting reports on whether a visit to the Yad Vashem Holocaust Museum will be included. As far as I can work out, though, the issue being negotiated is the length of the visit rather than whether it takes place. Meanwhile, PARKS AUTHORITY PREPARES MASADA FOR POTENTIAL TRUMP VISIT (Sharon Udasin, Jerusalem Post). THEATRE REVIEW: Review: Salomé (National Theatre).Yaël Farber revists the myth of the woman who demanded the head of John the Baptist (Matt Trueman). Mr. Trueman hated this production: "The South African director's own version of the biblical myth – a feminist reclamation – is so confounding that it might as well be written entirely in Aramaic." That sounds okay to me, but I can see it wouldn't work for everyone. For more positive takes on the Farber production of Wilde's Salomé, see here and here. Past posts on the historical Salome are here and here. For more on Salome and the arts, see here. APPREHENDED: Stolen Antique Coins, Jewelry, Seized in Arab Village (JNi.Media). This bust took place in the West Bank town of Beit Ula. There was another one in the town of Hawara (Huwara) last week. See here for that and other recent apprehensions in Israel and the West Bank. THIS WEEK'S DAF YOMI COLUMN BY ADAM KIRSCH IN TABLET: Terms of Service. In this week’s ‘Daf Yomi,’ why the law is in the details. In particular, the details about what percentage of sold land can be unusable for agriculture, how precisely the areas of the sold land has to be specified, etc. AUDIO: I fell in love with Armenian. Interview with Professor Michael Stone. Professor Stone has dedicated his life to Armenian studies and founded and directed for many years the Program of Armenian Studies at Hebrew University of Jerusalem (Vahe Kateb, SBS). Seen on Facebook. I have noted reviews of a few recent books by Professor Stone here, here, here, and links. His work on Second Temple Judaism and on Armenian literature is renowned. Some past posts on the Armenian language and alphabet are collected here. "The words of Job are ended." Or something. As a paratext, the colophon’s functions can be summarily and quickly described. It marks the ending of a text. In the era before printing this was a necessity, so that later copyists would know that they had a complete text before them to reproduce. This is the case with many Egyptian and Akkadkian colophons. As such, a colophon is an assertion of authority. In marking the end of a text it pronounces that text to be in some way, “finished,” whole or complete. It also protects the text from any supplementation by its very visual presence, because any additional text would be clearly marked as literally and figuratively outside the bounds of the normative text. REMNANT OF GIANTS: New True Legends ‘Documentary’: Holocaust of Giants (Deane Galbraith). Don't miss the video. What would we do if we didn't have Deane to, uh, dig these things up for us? Reports of the finding of giant skeletons go back at least to Josephus and show no sign of abating. Some relevant posts are collected here. And then there is this and this. FOR LAG B'OMER: The Life of Rabbi Shimon bar Yochai. A glimpse into the greatness of this towering scholar whose yahrzeit is commemorated on Lag B’Omer (Rabbi Dovid Rosenfeld, Aish.com). This essay is a nice compilation of (legendary) traditions about Rabbi Shimon bar Yochai (Yohai), also known as the Rashbi. The stories come mostly from the Talmud. R. Shimon is also the traditional (but pseudepigraphic) author of the Zohar, the largest and most influential Jewish mystical work. For more on him, start here and follow the links. ANCIENT JEW REVIEW: The Compositions Relating to the Levitical Line in the Qumran Aramaic Scrolls (Liora Goldman). These texts raise some fascinating questions. If, in their mythology, Levi was already a priest, what did their authors think of the elevation of the line of Aaron to the priesthood in the Mosaic Torah? That resulted in the tribe of Levi being made into attendants to the Tabernacle (Temple) and servants to the Aaronid (Zadokite) priests. That sounds like a demotion from the perspective of the Qumran Aramaic texts. Do these texts preserve memories of a non-Zadokite Levitical priesthood? Did such a priesthood survive into Second Temple times? Last year I discussed some of these issues briefly in my summing-up post on the "John the Jew" Enoch Seminar at Camaldoli. But I have many more questions than answers. RECENTLY REDISCOVERED: Biblical Artifacts Collected by anti-Nazi Polish Soldiers Found in Israel. The thousands of items in the archaeological treasure trove, which sat for decades in Jerusalem's Old City, span from the second century B.C.E. to the early 20th century (Nir Hasson, Haaretz). The, uh, collected artifacts were kept in a basement in the Polish Embassy. The IAA gave permission for most of them to be taken to Poland to be exhibited there. International law required that the two cuneiform tablets and a fresco fragment not be moved abroad. Yes, the artifacts were looted, but no one seems inclined to make a big issue of that now. These guys were fighting Nazis, after all. Sort of like Indy, only in real life. YONA SABAR: Hebrew Word of the Week: yerushalayim "Jerusalem." Timely. ARCHAEOLOGY AND POLITICS: Six-Day War Catapults Archaeology in Jerusalem to New Heights (Chris Mitchell, Christian Broadcasting Network News). Israeli Archaeologists Eilat Mazar and Gabriel Barkay (Barkai) tell CBN how the Six-Day War and the reunification of Jerusalem fundamentally changed the discipline of archaeology in the State of Israel and how their own careers were affected. ARCHAEOLOGY AND POLITICS: ISRAEL UNVEILS ARCHAEOLOGICAL GARDEN IN JERUSALEM’S OLD CITY. “Everything we are doing in Jerusalem is in order to reassure and confirm our existence here.” (Daniel K. Eisenbud, Jerusalem Post). The opening of the archaeological gardent was timed to coincide with the 50th anniversary of the reunification of Jerusalem at the end of the Six-Day War. The Davidson Center Archaeological Park and its connection with Elad have been somewhat controversial, even to the point of litigation. Background here and links. Some past PaleoJudaica posts on other archaeological gardens in Israel are here and links. A saint's tomb at Hippos-Sussita? ARCHAEOLOGY: Tomb of Unknown Saint Found in Israel, Archaeologists Deduce. Clustered churches in Hippos-Sussita in sixth century C.E. indicate mutual tolerance among early Christian sects, which was not to last (Ruth Schuster, Haaretz). The saint, or whoever she was, was a woman in her fifties buried in one of the five Christian churches in Hippos-Sussita in the sixth century. This article has a long and detailed discussion of the late antique Christian remains recovered at this site. For past posts on the excavations at the site of Hippos-Sussita, start here and follow the links. Many of the earlier posts dealt with pagan remains from the Roman period and late antiquity. EXHIBITION: The Lod Mosaic // This Exquisite Israeli Mosaic Has Been Seen Across the World but Never in Israel. Discovered in central Israel 21 years ago, this beautiful artwork has toured the world but still has no home in Israel. It’s worth taking a trip to see a small part of the masterpiece in Haifa (Moshe Gilad, Haaretz). Now, though, a small part of the mosaic is on display at the Israel National Maritime Museum in Haifa (until April 2018). The section on show is covered with fish, sea monsters and ships. It is incredible and is undoubtedly worth the trip. The big question now is why we have to journey to Haifa to see it, and not its home city of Lod in central Israel? Three institutions are partners in preserving and displaying the “Lod Mosaic”: the IAA is the professional body in charge; the Leon Levy Foundation and Shelby White are supposed to fund the IAA’s activities; and Lod City Hall is the host. The three provided answers to questions from Haaretz last week, all basically saying, “What’s the rush? Patience!” Sure, because it has only been 21 years and the mosaic has yet to be fully shown in Israel. This is a long, detailed article about this beautiful ancient mosaic. It's worth reading in full - soon, before it goes behind the subscription wall. The Lod Mosaic was on an international display tour for some years, and PaleoJudaica kept regular track of its peregrinations. Start here and follow the links. The same trail of links will lead you to information on a second ancient mosaic discovered recently in Lod. AND THEN HE WAS A SHE: Patrice Mince Sets Her Eyes on Six Legendary Sunken Treasures (Digital Journal). Regular readers who click through the link and read this press release will find it familiar and yet somewhat different. I noted the same press release here a few weeks ago, only the name of the intrepid explorer was Aaron Guetterman and he was a he. The same press release is still there. The six legendary treasures are the same, including those of the Copper Scroll, and the wording of the press releases are exactly the same apart from the name of the explorer and the gender of the pronouns. I could speculate on the reasons for for the differences. But instead I simply pass the story on to my readers as yet another unexplained Copper Scroll mystery. VENUE PROPOSAL: When Donald Trump wanted to hold Miss Universe pageant at Masada. US president reportedly believed that having a beauty contest at palace built by Judean king Herod would be a good PR opportunity (Ben Sales, JTA via Times of Israel). For whom the PR would have been good was not specified. The 2011 pageant was held in São Paulo, Brazil, instead. Background here. There have been operas at Masada but, as far as I know, no beauty contests. The Newark Stones as emancipationist forgeries? NOT ANCIENT NEW WORLD ARTIFACTS, ANYWAY: Archaeology: Newark ‘Holy Stones’ are 19th century fake news (Brad Lepper, The Columbus Dispatch). The Newark stones are Hebrew-inscribed objects found in found near Newark, Ohio, in 1860. They have been argued to be ancient, but no one remains convinced today. Dr. Lepper and his colleague Jeff Gill at the Ohio History Connection are making the case that the objects were forged in the nineteenth century by the Rev. Charles McIlvaine. They were intended as a compelling argument for the abolition of slavery in the U.S.A. The case sounds indirect to me, but Dr. Lepper really doesn't have the space to make it fully in this brief essay. I look forward to hearing more. Everyone agrees that the Newark Stones are not genuine ancient New World artifacts, although Rochelle Altman argued some years ago in a Bible and Intepretation essay that they are medieval Jewish artifacts that were placed secondarily in the locations where they were found. But if this theory was every published in a peer-review journal, I haven't seen it. Some past posts on the Newark Stones and other dubious New World Hebrew inscriptions are here, here, here, here, and here. Dr. Lepper and his theory come up in a couple of these posts. THE FORWARD: Fact-Checking The Bible—In Chicago’s Oriental Institute (Aimee Levitt). This is a dreadful, clickbait title, but the article isn't bad. It surveys the work of the Oriental Institute via an interview with postgraduate Joey Cross. There is particular attention to connections between the Hebrew Bible and ancient cuneiform inscriptions such as the Sennacherib prism. Some past PaleoJudaica posts involving Sennacherib and his invasion of Judah are here, here (sort of), here, and here. AT THE UNIVERSITY OF MICHIGAN: Announcing the 2017-18 Frankel Institute Fellows Led by Head Fellow Rachel Neis, our new fellows will explore the theme of "Jews and the Material in Antiquity." This fall, the Frankel Institute for Advanced Judaic Studies will host a prestigious group of scholars who will gather around the theme "Jews and the Material in Antiquity." They will be led by Head Fellow Rachel Neis. I noted the fellowship as upcoming and accepting applications last year here and here. Looks like they have come up with an excellent lineup. Who is a "neighbor" according to the Bible? PROF. RICHARD ELLIOTT FRIEDMAN: The Exodus, the Alien, and the Neighbor (TheTorah.com). If I were told I could only take one chapter of the Bible to a desert island, I think I would skip it and worry about other packing. But Professor Friedman's answer leads to an interesting essay. THE ANXIOUS BENCH: Alternative Scriptures and Necessary Amnesia. Philip Jenkins says there is nothing new under the sun or in biblical scholarship. And within the parameters he sets - groundbreaking overarching theories - he has a point. His post is the first of a new series. THE ASOR BLOG: Why 1 and 2 Kings? (Lester Grabbe). An introduction to Professor Grabbe's new study guide on 1-2 Kings: 1 & 2 Kings: An Introduction and Study Guide (Bloomsbury, 2016).